Disney Interactive Studios today announced a new three-dimensional Toy Story game – to be bundled with free 3D specs and released exclusively for Nintendo Wii. "Toy Story Mania! showcases an array of entertaining games based on the iconic characters and humor from the popular Disney/Pixar Toy Story franchise at the new Disneyland Resort and Walt Disney World Resort attractions," Disney's press release informs us. "In the game, players experience the fast-paced, zany fun of the Toy Story Mania! theme park attraction, which is an interactive experience requiring 3D glasses and involving rapid or quick-firing shooting galleries." "The Toy Story franchise is a fun, dynamic and heart-warming series containing characters and themes that connect with every age group," says Disney Interactive's Senior Vice President of Global Marketing Craig Relyea. Disney Digitals' 3D theatrical re-release of Toy Story is currently in the works and is set to open in US movie theatres on October 2, 2009, "followed by the 3D re-release of Toy Story 2 opening on February 12, 2010, leading up to the premiere of Toy Story 3 in 3D summer 2010." 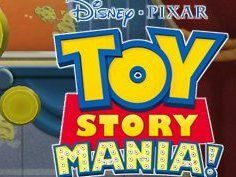 Developed by Papaya Studio, Toy Story Mania! will be available this autumn exclusively for Wii.